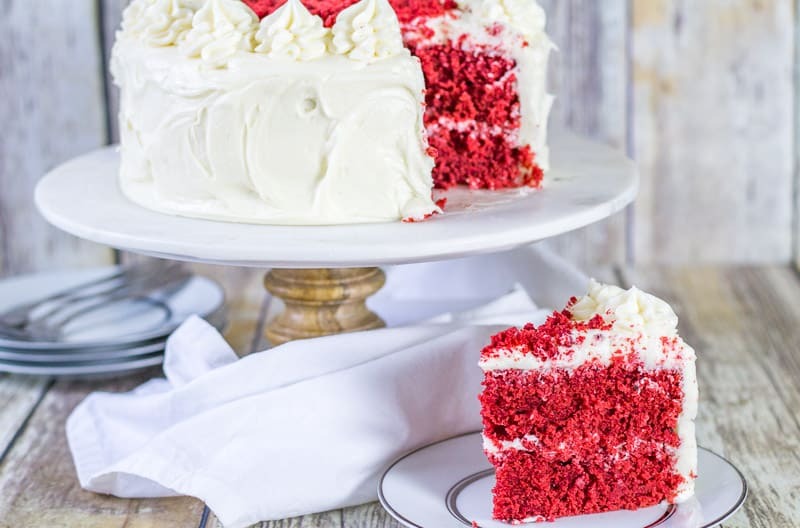 Just take a look around the internet and you’ll find tons of recipes for red velvet cake. Most of those recipes call for buttermilk, which is fine and I love it in cakes, but I’m even more of a fan of sour cream in cakes. 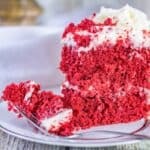 I just think it’s one of the best ways to add moisture to your cakes. 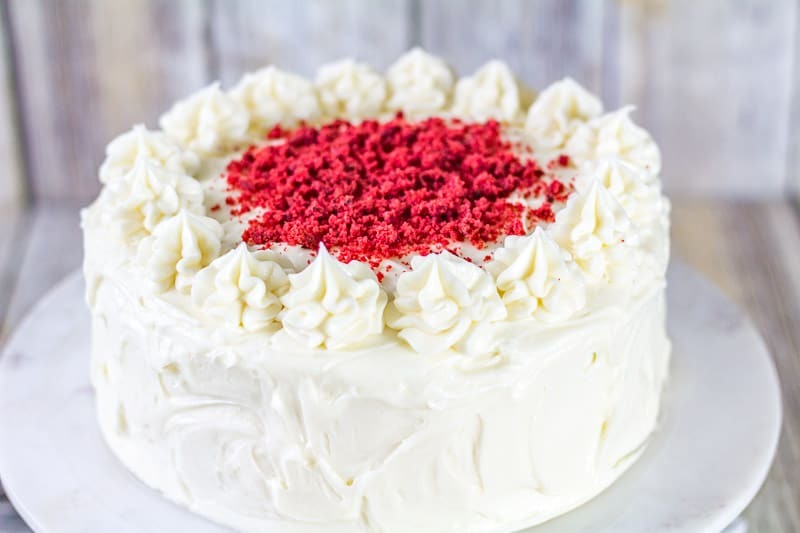 So, I set out to make a sour cream red velvet cake and I really think I hit the jackpot with this one. Ok, since we talked about buttermilk earlier and since we’re not using it in this recipe, I have a story and a question for you. I think this might be a southern thing, but I’m not really sure. One of my dad’s favorite snacks was cornbread and buttermilk. Now, if you get grossed out by buttermilk, just scroll on past this part of the post. Just warning you now. My dad would take cornbread, put it into the bottom of a tall glass and then pour buttermilk over it. He’d take a spoon, break up the cornbread and then just eat it all mixed up in the buttercream. He’d then leave the glass on the coffee table, apparently just to gross everyone out. The buttermilk would make these lines on the glass and it was just…ewww. Here’s my question…is this just a southern thing? Did anyone else’s parents do this? Or maybe do you do it? Just curious. I’m not sure whether that or my dad’s sardine snacks were worse. Ok, my point is we’re not using buttermilk in this cake. Yes, I know that was a weird segue, but here we are. 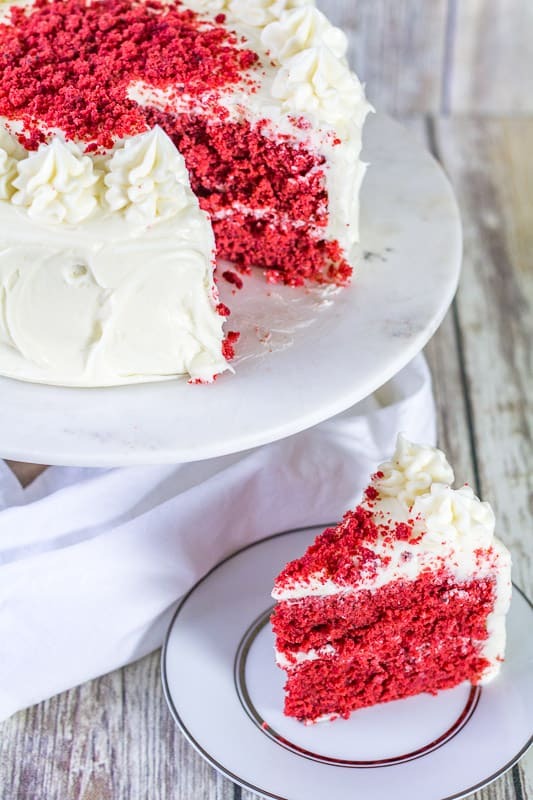 This sour cream red velvet cake is so moist and so good. It’s got just a hint of cocoa powder in it. That, along with the acidity of a touch of vinegar and the sour cream, really gives it that red velvet flavor. I used ‘no-taste’ red gel coloring. There are different brands out there, but I just used the one I had available near me, which was the Wilton brand. You can grab it here: No Taste Red Gel coloring. I like using the gel food coloring because it’s more concentrated. You’re not having to add so much of it and it’s not going to add any unnecessary liquid to your cake batter. I only used about a tablespoon of the gel coloring, which was slightly over half the container. 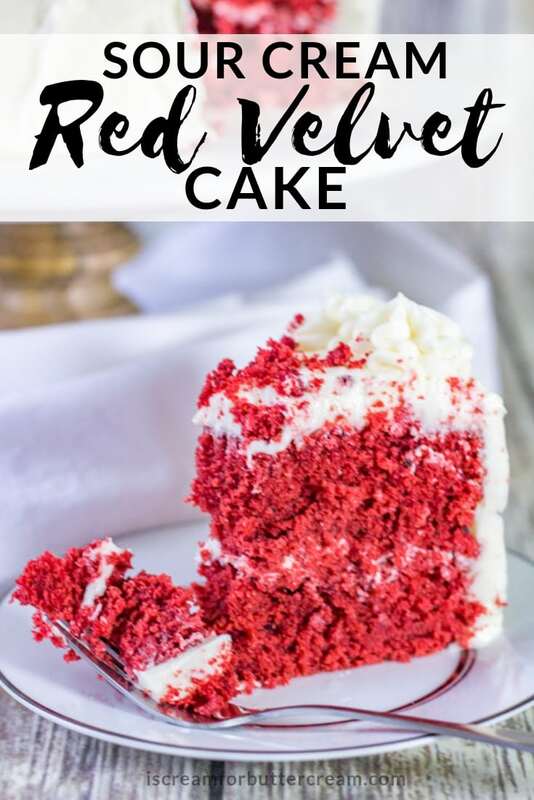 You can always add more if you want a really bright red color, but I tend to go a little lighter on the food coloring, just because I’m sure it’s not exceedingly good for your body. (Um, like sugar, butter and flour are?) Anyway, it was my effort to at least be a little health conscious. Ok, now to the recipe. I’ve even got a video just below the recipe. Plus keep scrolling if you’d like to download the cute recipe card for this cake. 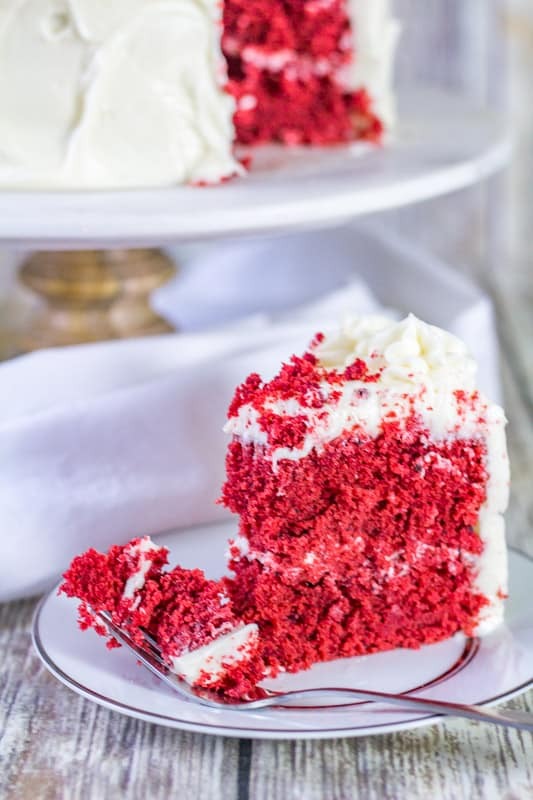 This sour cream red velvet cake is so moist and delicious, you'll want to make it every week. Add cream cheese buttercream and you won't be disappointed. Grease and flour two 8" round cake pans or three 6" pans. In a bowl, mix together the flour, baking soda, cocoa and salt. Whisk together and set aside. In another bowl, mix together the sour cream, milk, vinegar and vanilla. Whisk well and set aside. Now in your mixing bowl, mix the butter until creamy. Add the eggs one at a time, mixing after each one, but only just until combined. Alternately add in the dry and liquid ingredients. Start with 1/3 of the dry mixture, mix just until combined. Add in 1/2 the liquid mixture, mix until combined, then another third of the dry mixture and mix only until combined. Add in the last 1/2 of the liquid mixture, mix, then add in the last third of the dry mixture and mix just until combined. Be careful not to over mix. Add in the red food coloring. 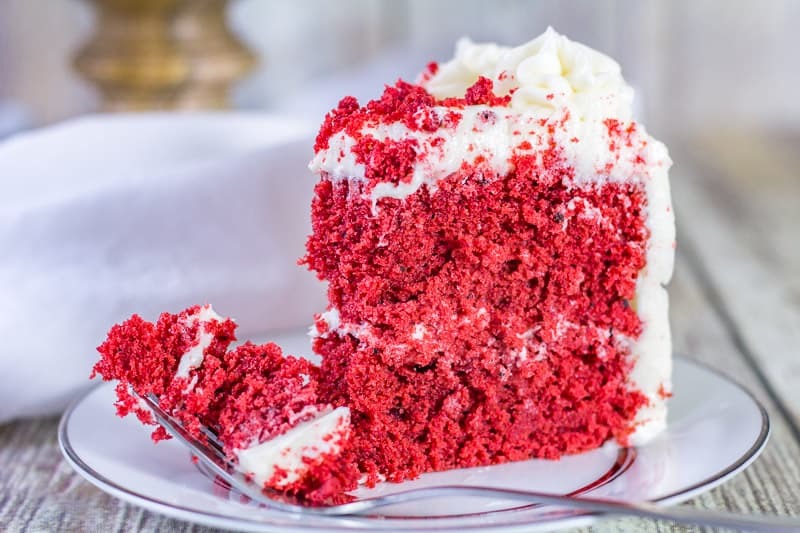 If you want your cake to be a deep red, add a little more red food coloring. Mix until the food coloring is well incorporated. Bake in a preheated oven at 325 degrees for about 50 minutes. Start checking at 45 minutes. The middle should spring back when touched. Want a free cute recipe card? Enter your email below to download it for free. 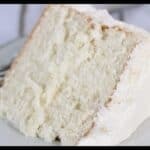 Don’t forget to grab the recipe for the Cream Cheese Buttercream! I hope you try this one out and if you do, let me know how you like it! Hi Lorrie, First I have a question…are you going with cream cheese buttercream, or the straight vanilla buttercream? If you’re using cream cheese, it’s a softer icing, so it doesn’t always do real well on stacked cakes. You could add in an extra cup of powdered sugar to it if you wanted. Also, since cream cheese icing needs to be kept refrigerated, I wouldn’t set the cake up more than about an hour before the cake is cut. First reason is you don’t want anyone to get sick from the cream cheese sitting out too long and the second is that you don’t want the icing to get too soft on you and cause problems with the cake stability. If you’re using just vanilla (american) buttercream and not the meringue type buttercream, you can leave it out of the fridge and set it up even a couple hours before they will cut it and it should be fine. As long as the cake isn’t in the direct sunlight and it’s not hot in the room. The Vanilla American Buttercream is much more stable than cream cheese buttercream. If you’re wanting a cream cheese taste to it, but don’t want to deal with keeping it cool and waiting til just before they event to set it up, you could always experiment with make the regular vanilla buttercream and then adding in some cream cheese flavoring. LorAnn oils has one. I haven’t tried it, but that might be the best of both worlds. Hopes this helps! Thank you Kara for such a quick response. The bride is set on cream cheese frosting. I will take your advice and add an extra cup of powdered sugar. It’s in the mid 30’s here in the evening (This is a night wedding ) so I’ve advised them to set the cake up in a cool area and away from heaters. I didn’t know about the cream cheese flavoring so I will definitely be trying that out before I take on another cake such as this one. Any other advice is so appreciated. Also, I love following you on your website and on Pinterest. You are so nice to share all of your knowledge and advice!! Thank you so much!! Oh you’re so welcome! A couple of other things I thought of…just make sure and keep that cake chilled as long as possible before setting up, but make sure it’s got a little time to get closer to temperature before it’s cut (which it probably will be fine). Also, since it’s a naked cake, make sure when you put it in the fridge that it’s covered well…not only in a box, but you might add some saran wrap loosely over the cake layers as well inside the box. Naked cakes can dry out easily, so hopefully that’ll help with that. Well, let me know how it all goes! I love buttermilk and cornbread; and yes, my children react just like you! My cake was amazing !! I ended up using your cream cheese buttercream recipe + 5 tablespoons of shortening. It was beautiful. The venue was nice and cool, I stacked my cakes…success ! Everyone loved it. The taste and texture were delicious on top of a completely from scratch red velvet. The frosting had a nice crust and thankfully was perfect. Love your blog! Thanks for sharing your great recipes and tips. I love sour cream in cakes too! 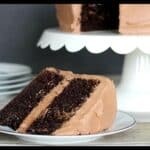 I need a white cake …..suppose I could use this recipe, eliminating the food color and substitute flour for the cocoa (only 3 Tbsp). Seems like a real classic recipe. Thanks for your thoughts! Hi! Just wondering if this recipe is also good for cupcakes? Thanks!! OMG! I am laughing so hard because my dad ate the cornbread buttermilk mixture as a late night snack. He also thought sardines on saltines with yellow mustard was the perfect afternoon snack (especially if on a boat). It definitely has to be a southern thing! Love your blog and videos! LOL!! Oh it sure makes me feel better that at least I wasn’t the only one that had to look at that gross cornbread concoction and smell those sardines! Totally a southern dad thing. Lol! Red Velvet for birthdays is a tradition in our family. I have always felt the recipe was dry, so I went searching. I made your recipe today and it is what I will use from now on! It was light, moist and delicious!! I am Red Velvet traditionalist, so I still make the original Ermine(boiled milk) frosting. But your recipe is most definitely the best I’ve made. Hi Kara, unfortunately we can’t get our hands on sour cream in this part of the world. So I was hoping I can use my homemade buttermilk like I do your vanilla cake? Do you think it’ll work out ,also you used all purpose flour here rather than cake flour..so I hope alternating for buttermilk won’t affect the moist nature. Hi there, yes I think substituting with buttermilk will be just fine. The difference in the type of flour shouldn’t have any affect on that. Hope this helps and let me know how it goes! Would the cake be alright if I put like half a cup of cocoa powder? I like the red velvet chocolate flavor to be a big stronger and the red to be a little more darker. I think that would be okay. I’m not sure how big an effect it would have on the moistness of the cake though. If you’re concerned about that, I’d add a couple tablespoons more of the milk. Let me know how it goes! Can I do the reverse creaming method? Yes that should be fine. You sound like you know what you’re doing, so you probably don’t need my next tips, but just make sure the butter is slightly cooler than room temp. Mix the dry stuff in a bowl, then the liquid stuff in another bowl. Add the butter in chunks to the dry ingredients until it’s crumbly, then 1/2 the liquid, mix, then the rest of the liquid and mix. You could mix in the food coloring with the liquid mixture or you could mix it in at the very end. If you do that, just try not to beat the batter too long. Hope this helps! Hello! I have a couple more questions. 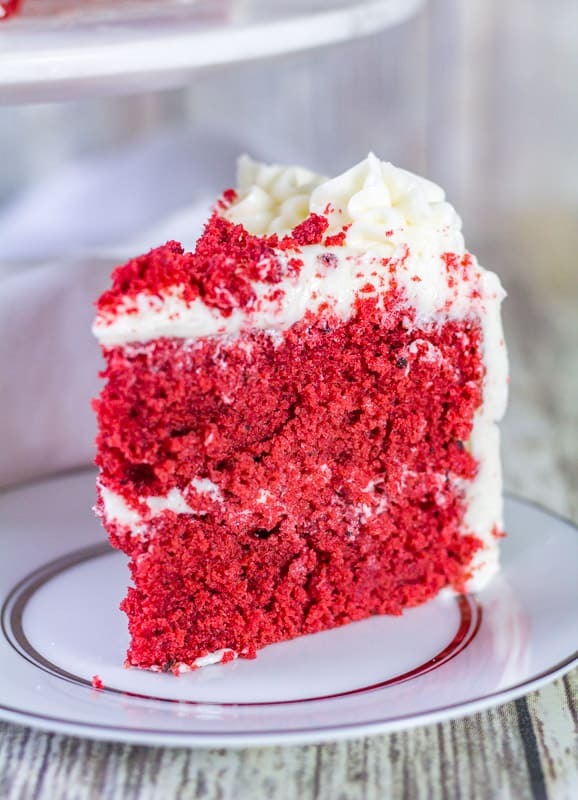 If I wanted to use cake flour could I sub in those two things for the 3 cups of cake flour and 2 cups of sugar and will the ratio be ok in this red velvet cake? I hope this is not confusing. Will I need to add more liquid because that is why you have slightly less flour in this recipe as it is not cake flour? 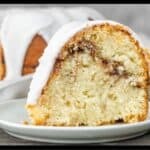 Hi Alyssa, If you want to use cake flour in this recipe, just use one cup plus 2 tablespoons of cake flour for every cup of all purpose flour called for in this recipe. You don’t have to change any of the other ingredients though. You can use the amount of sugar and liquid that this recipe calls for already and it should be just fine. I hope this answers your question! Would 1 1/2 recipe be enough for two 10 inch cakes? 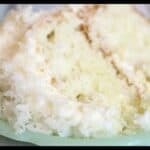 Absolutely LOVE your vanilla bean cake! It’s the new go to for me, thank you! Can i use 1/2 buttermilk instead of wholemilk? Hi Karen, you can use buttermilk in place of the whole milk. That should be just fine. Hi Sandra. I’m happy to help. These stand up mixers give us so many speed options, right? Here’s what I do: I normally mix most everything on medium/low or just medium unless I”m creaming the butter and sugar together in which case, I’ll mix on maybe medium high, so I get more air incorporated. Generally when I mix cake batter, I start by turning the mixer on low but just for a few seconds, so that whatever ingredients I’ve added don’t splash out at me, then I’ll switch it to medium/low (the next speed up) or just medium (the next speed up from that). When I mention mixing until just incorporated, that’s more about the amount of time you mix. You can start at low, just to make sure no ingredients fly out at you, but then switch to medium/low or medium and just mix it long enough for the ingredients to be just mixed together. You don’t want to mix too long because that’s what causes problems with the cake texture. Once you add your food coloring, you can just mix on low for a couple seconds, then go up to medium low or medium and mix until the coloring is mixed throughout. Just be careful not to mix for several minutes. That’s too long. I hope this helps! Thank you for replying so swiftly Kara! That’s incredibly helpful- I aim to make the cake within the next couple of weeks so trying to make sure I know what I’m doing first! so I don’t waste ingredients. Thanks a million! Can I ask- I would like to try this as a tiered cake, so if I make just one layer of a 12 inch tier at one time (as my oven wouldn’t be big enough to do the 2 together), would 3/4 of each ingredient of the original recipe work? (So basically instead of doing two 8 inch cakes I would be doing one 12 inch.) And if I scale the recipe down, do I also need to mix the ingredients for a little less time? Hi Sandra, that makes me so happy that you love the cake!! For a 12″ cake pan, you could do a 3/4 recipe, but that might be kind of a pain to measure and may or may not come out right. If it were me, I’d probably just make an entire cake recipe and then when I fill the pan, if I had any batter left over, just make a couple cupcakes with that extra batter. It probably wouldn’t be much batter left over though (if any). Also it’s good to use a heat core or at least a flower nail in the middle of your pan, so it’ll bake up evenly…and watch your time, since you may have to bake it a bit longer. If you do decide to just do 3/4 of the recipe, you really don’t need to worry about mixing it for less time. Just mix until the ingredients are well combined, but I don’t think cutting it down that small of an amount will make a huge difference in mixing times. Hope this helps! You’re a star, thanks very much! I will go with the original recipe amounts + heating core, that all sounds like a sensible plan 🙂 By the way, I forgot to ask- is the recipe for 2 inch or 3 inch deep cake tins? I’ve been using 2 inch ones but my 12 inch tin is 3 inches deep. My cake recipes are written for 2″ deep pans, but actually your 3″ pan will probably work out perfectly if you just make one entire recipe instead of the 3/4.